Make yourself at home in one of the 270 air-conditioned rooms featuring fireplaces and LCD televisions. Your room comes with a Select Comfort bed. Complimentary wireless Internet access is available to keep you connected. Conveniences include safes and coffee/tea makers, and housekeeping is provided daily. Featured amenities include a computer station, express check-in, and complimentary newspapers in the lobby. Limited parking is available onsite. Featured amenities include a business center, express check-in, and express check-out. Planning an event in Mecca? This hotel features 1291 square feet (120 square meters) of event facilities. Self parking (subject to charges) is available onsite. With a stay at Ajyad CROM Hotel in Mecca, you'll be within a 10-minute drive of Kaaba and Great Mosque of Mecca. 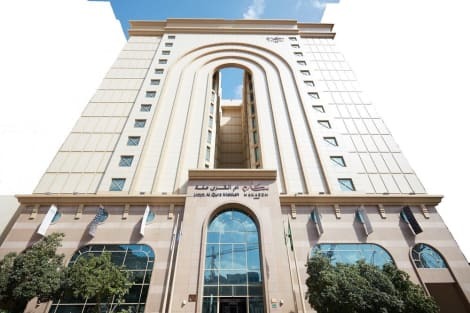 This 4-star hotel is 0.4 mi (0.6 km) from Well of Zamzam and 2.8 mi (4.5 km) from Abraj Al-Bait Towers. Make yourself at home in one of the 810 air-conditioned rooms featuring minibars. Complimentary wireless Internet access keeps you connected, and cable programming is available for your entertainment. Bathrooms have showers and complimentary toiletries. Conveniences include safes and desks, and housekeeping is provided daily. Enjoy Asian cuisine at Al Multazim, one of the hotel's 2 restaurants, or stay in and take advantage of the 24-hour room service. Snacks are also available at the coffee shop/café. Breakfast is available for a fee. Enjoy a meal at the restaurant, or stay in and take advantage of the hotel's 24-hour room service. Mingle with other guests at the complimentary reception, held daily. Buffet breakfasts are available daily from 6 AM to 10 AM for a fee. Make yourself at home in one of the 186 air-conditioned rooms featuring refrigerators. Bathrooms have showers and complimentary toiletries. Conveniences include phones and safes, and housekeeping is provided on a limited basis. Satisfy your appetite for lunch at the hotel's restaurant, Al Taai Restaurant, or stay in and take advantage of the 24-hour room service. lastminute.com has a fantastic range of hotels in Makkah, with everything from cheap hotels to luxurious five star accommodation available. We like to live up to our last minute name so remember you can book any one of our excellent Makkah hotels up until midnight and stay the same night.